That’s a tough one! There are so many fascinating and interesting things about China with its thousands of years of recorded history. I recently was researching the development of science and technology in China and that is quite fascinating. But one of the most interesting things I found was that a Han Dynasty document, the Hou Hanshou, recorded the travels of General Ban Yong in the 2nd century and mentions a Western land which the Chinese called “Da Qin”. Literally it means something like “Great Qin” or Great China and refers to an empire in the West that they believed to be as grand as their own—namely the Roman Empire. It was said that Ban Yong made it to the Eastern edge of the Mediterranean Sea and was dissuaded from making the last part of the journey to Rome. This changed my grade school given view that Marco Polo in the 13th century was the first contact of the East and the West and I found other instances that showed China did have knowledge of the Roman Empire, even recording visits from Western emissaries prior to 1000 A.D. In my mind, it brought the world closer together at an earlier time than I originally thought, an idea that appealed to me in today’s “global village” where the world is coming closer together. It became the inspiration for my first manuscript, the prequel to Butterfly Swords, which for right now is still hiding on my computer. 3. In 2009 you won the Golden Heart award for historical romance. What impact did becoming a finalist and then winning the industry’s most prestigious award for unpublished writers have on your career? The Golden Heart can mean many things for many people. For some, it may not make a difference, but for me and for Butterfly Swords, it was the key. I’d be nowhere without the Golden Heart. Though my manuscript had gotten some interest from agents, it was still very risky. I think the nomination made people (including myself) think maybe…just maybe. I really feel that everyone wanted to see if such a long shot had a chance. We want to believe! I had been querying and submitting for nearly a year, but from the point that I received the nomination, I accepted representation with an agent, went on submission to New York, and accepted a contract with Mills and Boon within a space of about twelve weeks. The space between the GH nomination and RWA conference in 2009 was truly a golden, Cinderella time for me and I’ll never forget it. 4. If you could be transported back in time to any era other than Tang Dynasty China, where would you go? 5. What’s the best advice someone’s given you about writing? How about the worst? The best advice was from my writing mentor, Barbara Ankrum, who told me “Keep writing forward.” And “Everything is fixable.” You don’t know how many writer quibbles that resolves for me. The worst – and I have to qualify that it’s actually GOOD career advice, but bad for me because I have no idea how to do it—was to write something more marketable in a European setting. Tell us about The Dragon and the Pearl. 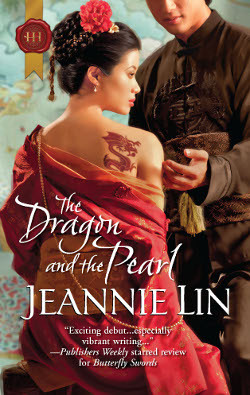 In the Dragon and the Pearl, a resourceful courtesan engages in a contest of wills against the ruthless warlord who had captured her. It’s a Beauty and the Beast story with intrigue and power struggles set in Tang Dynasty China and the sequel to Butterfly Swords. 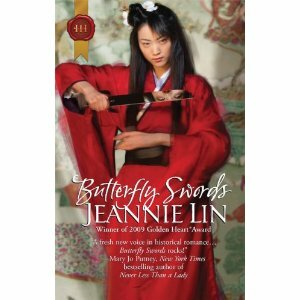 Jeannie’s giving away a copy of her debut, Butterfly Swords, and her latest, The Dragon and the Pearl. That’s right—two winners! Leave a comment by Monday October 24th to enter. Winner of the Victoria Dahl giveaway! The last book I remember reading about China was James Clavell’s Tai-Pan. So obviously it’s been a while but I think it’s a very fascinating subject and one I would love to read more about. I also have to say how much I love your covers! 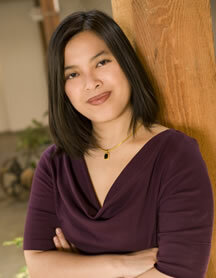 Thank you for bringing Asian flair and flavor into the historical romance world. I can’t wait until the next one! Both Butterfly Swords and The Dragon and the Pearl look very interesting. I haven’t read anything set in China in a while! Thanks for the giveaway. Sorry for jumping in so late, but I wanted to thank you for the interview. I really enjoyed the questions and can talk about research and obscure Chinese history for days! @Karen – I’m always on the hunt for good stories — well any good stories — but good romances with Asian culture or characters in particular. I found Kelly Hunter’s Red Hot Renegade set in Singapore to be AWESOME. I also love Jade Lee, who writes Regency romances on one side and then Qing dynasty China on the other, which I find incredible. @catslady – I have Tai-pan on my TBR list because I want to write a book in that era. Right now I’m exploring 8th century China, but the world of 19th century China is the one that many people are more familiar with and has a lot of potential for storytelling. Plus I LOVED the miniseries for Shogun as a kid. The elements of a western “stranger in a strange land” in Shogun inspired a lot of what you see in Butterfly Swords. @Julie – A pleasure! Next one is already in the pipeline. I will post details as soon as I know dates! Being Asian myself, I tend to watch more Chinese shows than reading. Your books bring an interesting flair to romance and I’ll be adding them to my TBR pile. Thanks. “Keep writing forward” sounds like a good advice and one that has helped you. I hear from so many writers that the key to writing is to well…write. It’s a lot harder than it sounds but then again the best things in life takes dedication and work. I’m glad you didn’t give up as I do like the sound of your stories. I read a lot of historical romances but not many set in places such as China. I’ll have to keep your books in mind. @SusanT – I watched a lot of Hong Kong TVB serials growing up. They’ve totally invaded my creative space. Oh, the melodrama! @Na S. — “Keep writing forward” — So hard and yet so easy! I’m trying hard to recall a literary letter I once read by a famous author to his brother about that exact thing. Basically finding the book you want to read that doesn’t exist yet and then — the solution being at once simple, yet terrifying — sitting down and writing it. Argh…can’t recall who wrote it, but it was such a great inspiration. Thanks for stopping by and commenting! I loved your Butterly Swords, Jeannie. such a great book. Hubby and I spent four weeks in China last month and this has definitely increased my fascination with the country. I’m looking forward to reading your new release.